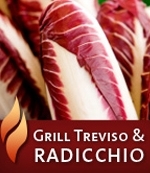 Radicchio and Treviso are great on the grill. Don’t pass up the produce aisle when you’re looking for delicious items for the grill when the weather is warm. Grilling brings out the natural sugars in many vegetables and lettuces, such as romaine and radicchio. Quarter the radicchio and treviso so the bottom of the produce holds the segment together during the grilling process. Baste with olive oil before grilling, and finish with a sea salt as you take the chicory from the grill, and that’s it! Enjoy these grilled treats with your favorite steak or Portobello mushroom, add a balsamic dressing or sprinkle with blue cheese, and you have a beautiful, nutritious summer-time meal that everyone will love. For more grilling ideas, please browse our Grilled Radicchio Recipes. Chef Brandon Miller, of Mundaka Restaurant in Carmel, California serves Grilled Royal Rose Radicchio with Lemon and Bacon to his patrons all summer long. The chef has also been featured on KTVU San Francisco’s Rosy Chu Show and the Sacramento & Company Morning Show demonstrating this recipe. You can also stay current with Royal Rose via Facebook or on our Twitter feed at @RRRadicchio, or talk to our Marketing Manager directly at @RRTreviso.